ONSCREEN Create video clips of your favorite Star Wars action figures, vehicles and playsets, then use the Hasbro Star Wars Studio app to add exciting special effects to the video clip! Compose an intergalactic action scene with your Star Wars action figures, vehicles and playsets. Launch the Hasbro Star Wars Studio app and select an (e.g., “Stormtrooper”). Hit record to capture your video clip. Overlay the thrilling visual effect with actionpacked audio to take your video clip to the next level! Watch as a Stormtrooper invades your screen and starts blasting! Save your video clip to your mobile device to replay! LED Y Connect your toy to the Hasbro Star Wars Studio app through Bluetooth to your compatible device. Control the Rapid Fire Imperial toy motions using the App’s Controller interface. o Walk forward o Turn the Rapid Fire Imperial toy’s Command head o Fire the Rapid Fire Imperial toy’s darts o Activate the lights and sounds of the Rapid Fire Imperial toy’s chin cannons Use the DIRECR to save a short sequence of motion commands that can be activated while capturing a video clip. The remote control feature of the Hasbro Star Wars Studio app is only compatible with Hasbro’s Rapid Fire Imperial toy (sold separately) and is not compatible with prior apps or other toys. ™ FEURES Fantasy Action Figure Visual ! Authentic Sound Effects! 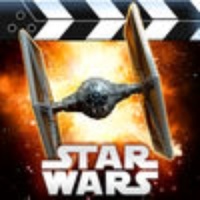 2 free Star Wars special effects with download Play to unlock 3 additional Star Wars special effects! Fast and easy to use! Add fantasy s to any video clips recorded with this app. Remote Control an Rapid Fire Imperial toy. o Walk forward o Turn the Rapid Fire Imperial toy’s Command Head o Fire the Rapid Fire Imperial toy’s darts o Activate the lights and sounds of the Rapid Fire Imperial toy’s chin cannons Save a short sequence of motion commands that can be activated while capturing a video clip. Free Star Wars special effetcs include Stormtrooper and XWing Strafe Please note that this app gives users the ability to create video clip recordings with audio and visual effects and save them locally to the Hasbro Star Wars Studio app and/or the user’s mobile device; however, these video clips are not shared with other users through the app and are not collected or shared by Hasbro or any third party companies. iOS 7+ iPHONE 5, 5c, 5s iPHONE 6, 6+, 6s, 6s+ iPad 3, 4 iPAD Air, Air2 iPAD Mini 2, 3, 4 Check www.starwars.hasbro.com for compatibility, availability, and instructions. Make sure your device supports this app before downloading. Other devices may be compatible but are not supported. Updates affect compatibility. PNTS The Hasbro Star Wars Studio app requires an Internet connection or WiFi) to download the app, download effects, and download app updates. The Hasbro Star Wars Studio app is free to download and play, but additional ingame items can be unlocked via the following ways By scanning effects codes contained in specially marked Hasbro Star Wars toys; or Over time by earning rewards through play. Hasbro and all related logos are trademarks of Hasbro, Inc. © 2016 Hasbro. All Rights Reserved. © & ™ Lucasfilm Ltd. Check these links to find your download for Star Wars Studio FX App for & iOS or for your device iPod TouchiPadiPhone. The app Star Wars Studio FX App is compatible with te following devices.